A performance art project that combines poetry, visual art, and music to highlight the lived experience of mixed race in a world obsessed with strict categorization. The art associated with the performance is being drawn from Perez’s B(lack)NESS & LATINI(dad), which focuses on the use of spoken word, oral history, and hip-hop to tell his story as an introduction into examining the current sociopolitical moment. The goal of these performances is to interrupt peoples’ lives, for just a moment, to introduce a vivid examination of contemporary political, and social struggles throughout Perez’s personal narrative. His hope is to interject a raw and unapologetic critique of innately human experiences and emotions so often ignored to avoid issues of race relations and privilege that cause us stress and anxiety. This avoidance ensures the persistent existence of social ills such as racism, classism, and other forms of oppression. This raw, personal, duality to today’s cultural times took place in Oppenstein Park on July 23rd, from 11:30 a.m. to 1:30 p.m.
As a poet, activist, father and more, Vincente Perez focuses on the lived experiences of race in America through several mediums. His work centers on Black and Latin experiences with a special emphasis on Hip-Hop, Spoken word, Narratives, and Identity Politics. 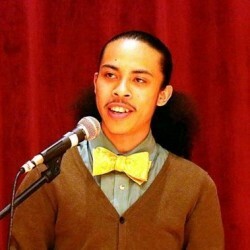 Through a unique style of mixing political commentary, personal experience, and poetry, Perez will challenge the idea of our distinct political, social, and economic lives by interjecting stories and political messages through raw emotions that blur the lines that have been arbitrarily defined and marked out for us by others.